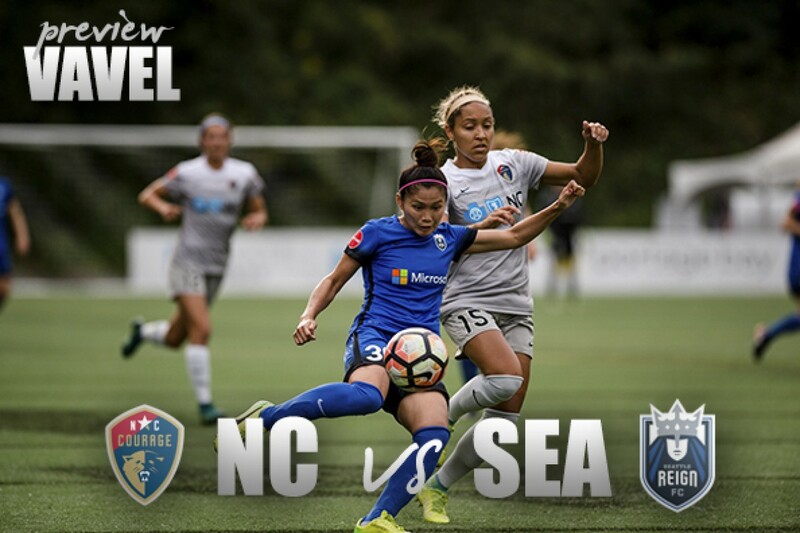 The North Carolina Courage will host the Seattle Reign FC on Wednesday, April 18 at 7:00 pm at WakeMed Soccer Park in Cary, NC. The two teams will face off in the first midweek game of the season. 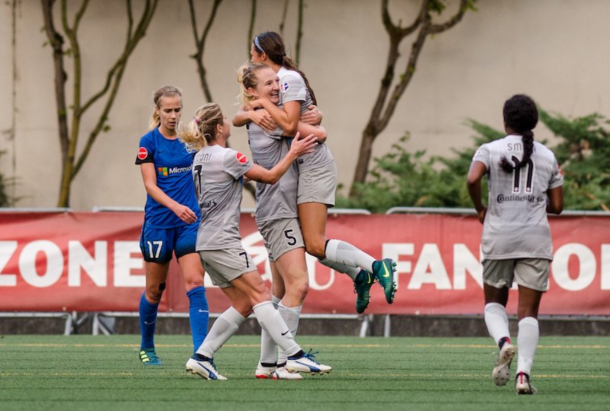 The North Carolina Courage (3-0-0) and the Seattle Reign FC (2-0-0) will face off in a match that that will pit the last two perfect teams in the National Women's Soccer League against one another. The Reign will have the harder of the circumstances on Wednesday night after playing in New Jersey on Sunday afternoon in a cold and rainy match against Sky Blue FC. Apart from the long time away from their home training facilities, Seattle suffered a far greater trauma when it was announced that Reign midfielder Megan Rapinoe suffered a hamstring injury and will not be able to play on Wednesday. The Courage, on the other hand, will be gaining the services of midfielders Sam Mewis and Elizabeth Eddy for the midweek match. The Courage and Reign are the only teams left in the NWSL without having suffered a draw or loss. The Houston Dash are technically undefeated after earning draws in their first two matches of the season, but without having secured a win they are tied for sixth in the standings. To put things in perspective, the Courage and Reign have won five games between them while the other seven teams have earned just four wins. The Courage played each weekend of NWSL play so far in 2018. They topped the Portland Thorns FC and Sky Blue FC 1-0 in consecutive home matches to open the season. The entire league took a break for the FIFA window, and the following weekend the Courage beat the Washington Spirit 4-2 on the road. North Carolina has the most prolific offense in the NWSL through three games, leading the league in goals (6), shots (42), shots on goal (19) and corner kicks (24). The Reign have had an equally successful to start the season. After an offseason coaching change, Seattle opened the season at home against the Spirit and went up two goals before conceding a goal to leave the final score at 2-1. Seattle then had a bye week and the FIFA break before their next regular season match in New Jersey. They earned an early penalty kick that was easily converted by Megan Rapinoe in the pouring rain and blowing wind, and the game ended up 1-0. Seattle's Jodie Taylor had a chance to extend the lead on a PK of her own, but Sky Blue goalkeeper Kailen Sheridan made two fantastic saves to keep her team in the game. After the game on Saturday, Courage head coach Paul Riley said "Seattle, I think, is probably the top team in the league for me right now. They look like the most settled team and I think they are going to cause us some problems. Keeping [Megan Rapinoe] quiet's going to be tough. I think it's going to be a great challenge for us." Unfortunately for Seattle, they lost Rapinoe for at least one match after she strained her hamstring in the inclement weather in New Jersey. The loss of one of the greatest playmakers in women's soccer swings the odds decidedly in the favor of the Courage. The Courage beat the Reign in all three matches played between the squads in 2017. In North Carolina, the Courage won 2-0 and 1-0, and then the lone match in Seattle ended with a 2-1 Courage victory. History is certainly not doomed to be repeated here, but if I had to make a prediction I would say that a 1-0 Courage victory is the most likely outcome. Both teams are coming off short weeks, but the Courage are gaining two players and have the advantage of an extra day of rest and home field advantage while the Reign lost their best player and will be competing away for the second consecutive week. The positive for the Reign? They will be off this weekend, so no three-game week and an extra ten days for Rapinoe's hamstring to rest before their next match on April 28th in Orlando.